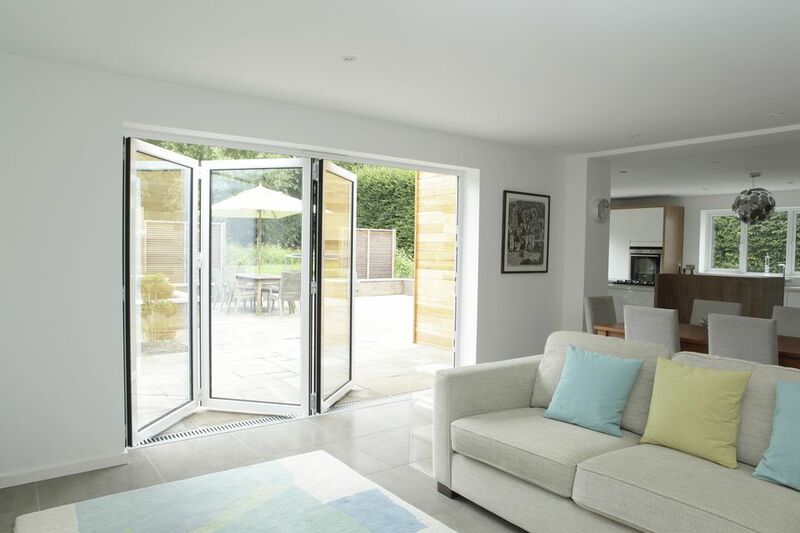 Bi-fold doors have long been a staple of homes because they are lightweight, inexpensive, and can be installed by one person. 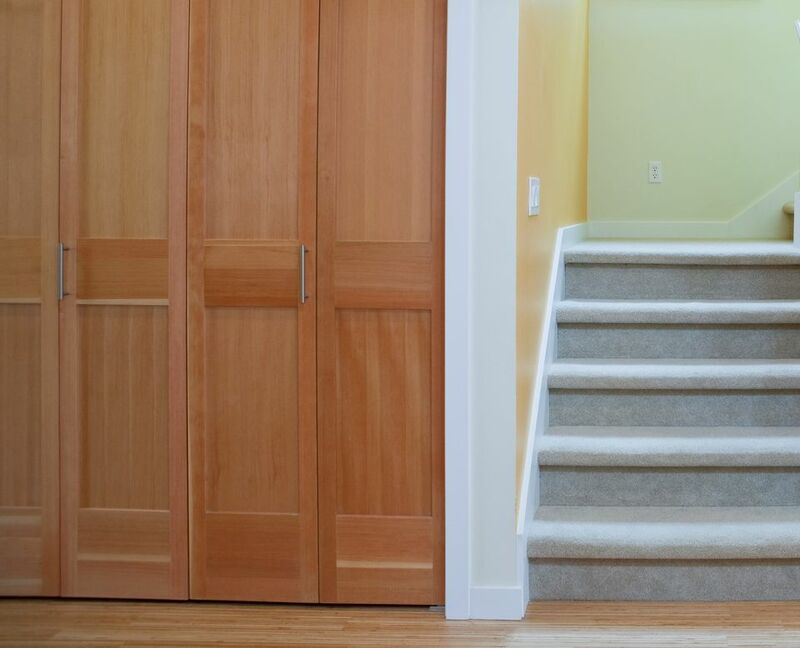 While they are not designed to soundproof a room or keep out intruders, they do an excellent job at providing one basic service: covering areas that you would prefer not to see, such as laundry nooks, pantries, wardrobes, and general storage areas. Putting up the door itself is easy. Fitting the hardware into the door frame can the tricky part. To install your bi-fold door you'll need the door itself, a lightweight hammer, a cordless drill, and drill bits. Locate the top end of the door. Due to the number of unusual parts, it is a good idea to prepare materials as close as possible to how they will be in the end product. So in this case, set the door on the end and climb on a chair or ladder to see the top of the door. Here you will find two holes. Locate the hole that you intend to be the "hinge end." The hinge end is the side that will be closest to the door frame. For this step, choose the smooth pin. Push the pin into the hole that you located in the previous step. Make certain it goes in as far as it can. Tap lightly with the hammer if needed. Push in the roller pin with the wheel as far as you can in the other hole. This is the end of the bi-fold door that will be sliding through the guide. Tap the roller pin lightly with a hammer to set the pin all the way in. Because the roller pin has a plastic wheel, it will break if hammered too hard. If you happen to have a rubber mallet, this is best. If not, use your lightest hammer and gently tap it in. Now you should have one pin left: the ridged pin. Get off the ladder. Unless you happen to have a couple of sawhorses handy, you can set the ladder on its side as a temporary sawhorse for this next step. Or simply lay door on the floor. Lay the bi-fold door across the ladder. Insert the pin on the end of the door that will be closest to the door frame (i.e., the "hinge end"). Tap lightly with a hammer to get it all the way in. Screw top metal guide into the top of the door frame. Make sure that the guide is positioned so that the small metal hinge-rest (see in photo) is closest to the door frame. Since gravity is working against you, it may be difficult to screw in these screws without guide holes. This is where your drill bits come into play. Begin by drilling a small pilot hole with a drill bit that is smaller than the screw itself. Install the L-shaped bracket at the junction of the door frame and floor. Two screws placed in the door frame should be sufficient, but an additional hole in the bracket is provided in case you want to screw it into the floor for added strength. Make certain that you are installing the L-shaped bracket in the right direction: the slit with the "teeth" should be horizontal. Return to the metal guide at the top of the door frame. Push in the spring assembly into the end of the guide farthest away from the "hinge end" of the door. This should snap in by hand. Do not hammer it, as it will break easily. At this point, it is a matter of putting the door on. It may be helpful to have two people for this step. First, insert the smooth pin into the top metal guide. Swing the bottom of the door into place so that the ridged pin rests in the L-shaped bracket. Do not worry about getting the roller pin in the guide yet. Once the smooth pin and the ridged pins are in place, get on the ladder and gently force the roller pin into the metal guide. Don't Call a Glass Company For That Broken Window. Do It Yourself.